Don't pass up this set just because of the cute picture on the cover! This book and online audio set is perfect for a budding whistle player, or for an experienced player that wants a big book of new tunes! This tutorial goes into great detail for beginners that know nothing about reading sheet music. Most tutorials seem to move at a faster pace than students can keep up with, unless they play the few simple tunes in the beginning of the book over and over again (you can only play "Yankee Doodle" so many times, before you - and your family - never want to hear it again). This one starts out slow, but also has many tunes for when you become more advanced in your playing - over 150 tunes in all! Online access to audio of the tunes is also available (see the list below). It also has something almost unheard of in other whistle tutorials - Duets! There are many of these scattered throughout the book, and are great if you already play, and are helping someone learn how to play. The duets range in difficulty from very basic to complex. 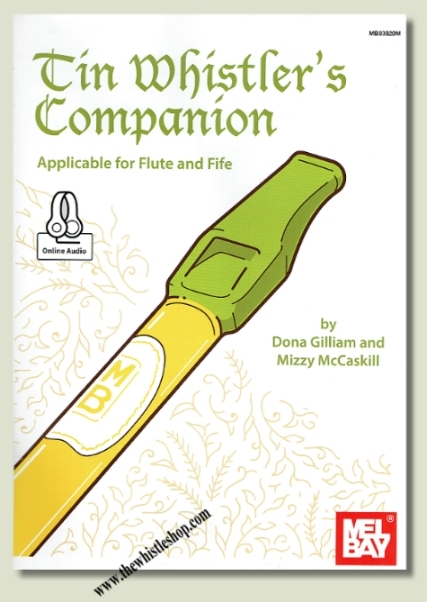 "This book is the one of the most comprehensive tin whistle tutors available, containing over 150 delightful tunes in a variety of colorful music styles. Classical, folk and Irish melodies are presented with supplementary guitar chords. The carefully sequenced lessons guide the player through note reading while introducing the full range of the instrument. Ensemble music is also included, and the repertoire can be played by fife and flute players (in the key of D). Includes access to online audio of selected pieces and exercises performed with guitar accompaniment in stereo." You will need to have a Whistle in the key of D (Low D or High D) to make proper use of this book. All the tunes are written in keys that are meant to be played on a D whistle. Take a look at the Whistle Section of our online catalog if you need a D Whistle.